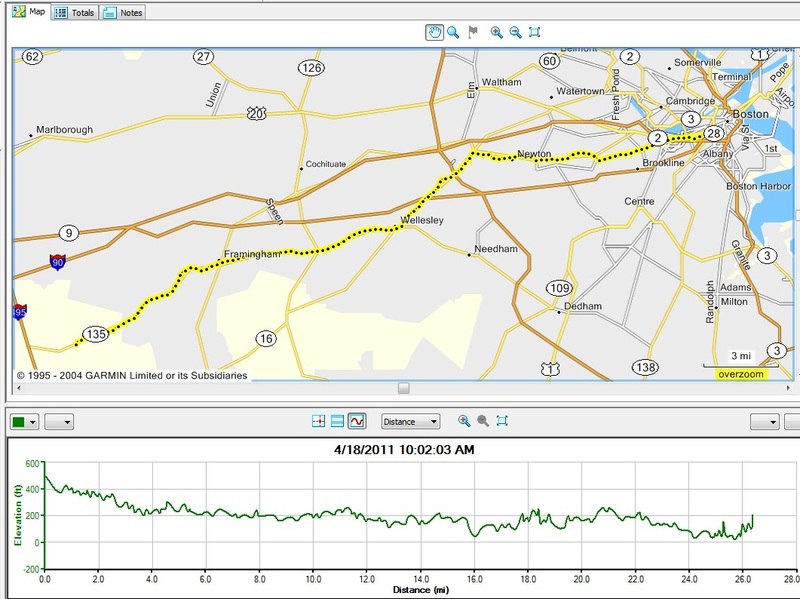 The Boston Marathon course runs from Hopkinton, through several small Massachusetts towns, east to Boston. Many people, more experienced, than me, have written extensively about the course, terrain, highlights, landmarks, and challenges. Instead, I am just going to stick to a few of my observations. In the descent out of Hopkinton, I was keeping a nice pace right around 7:00/mile. To be honest, the crowd was just right, and I could not have gone much faster without really pushing myself to swerve and sidle through all the other runners. I started the race with my headphones in thinking that I might want/need a little pick-me-up later in the race, but I never even considered it. In fact, I usually listen to some music prior to a race as well, to get the excitement going, but you can imagine I was more than excited enough just being on the start line. 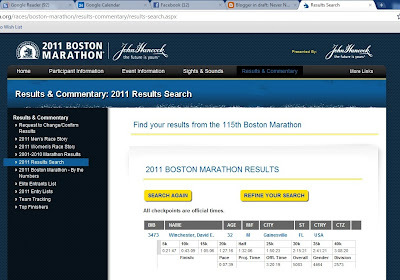 After all, my goal was to finish strong and enjoy the day, not self-destruct trying to get a PR or a sub-3 hour finish. The scenery was lovely, though some trees had not yet begun to bloom or green up yet. The early course is along an old country road, 2 lanes, shut down the whole way and bustling from shoulder to shoulder with a sea of runners. I was expecting it to thin out, as with most races, but it never really did. Start to finish, I always had hundreds of runners within my sight just in front and behind. Also packed to the brim were the sidewalks and barricades. The support was incredible, and unlike any race I have seen before. Some who have also run NYC tell me that the support there is equally impressive, and I could certainly imagine that. For this race, I could not go more than a half a mile without hearing someone cheer "Go Gators!" or "Go Florida!" With both my Florida Track club singlet and my Florida Gators visor, I was conspicuous. It was almost as if Florida was a foreign country to these Bostonians; I felt like I was getting as many cheers as the Irish and Swedish runners that were nearby me. Some of the supporters took advantage of the holiday (Patriot's Day) and celebrated as many do with spectator sports by ingesting large quantities of two-carbon-fragments in the form of beer, wine, and hard liquor. Unfortunately, one young man was in a serious accident when he fell through a skylight while enjoying the race with his friends on the roof of their building. The support was so incredible that this is the first race I can remember where the mile markers just seemed to vanish into the background. While I was always aware of which mile of the race I was on, I never really found myself wishing for the next to arrive. 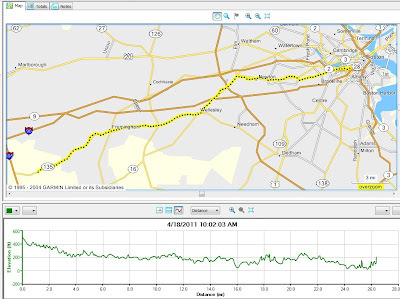 Time flew by as I ran; before I knew it we were in Ashland, Framingham, Natick, and approaching Wellesley. Now, Wellesley does deserve special mention, specifically the unrivaled support of the Women of Wellesley. These women, once many years ago banned from cheering the runners, are now well known as the loudest cheering section on the race. They form a solid wall of cheers (The Scream Tunnel) for a good quarter mile or so. You cannot miss them and for that matter you cannot fathom their cheers unless you experience it for yourself. The Women of Wellesley are also well know for supporting runners with kisses of affection, support I politely declined to accept (they hold signs reading "I majored in kissing", "kiss me if you're in the Army", "kiss me it's my birthday"). 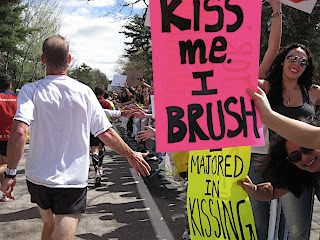 However several other runners accepted their embraces, fleetingly before running on towards Boston. The even-that-much-better-support I had was my wife, who waited for me on Heartbreak Hill. As I mentioned before, Boston's T system is pretty good at getting people around, even on days like Marathon Monday and so she was able to make her way several miles out of downtown to wait for me, take a few pictures, give me a quick hug, and then hop on the train back to town while I ran the last few miles. Speaking of the hills, I knew to expect them, and they were every bit as challenging as I had been told. That said, I felt like I did a strong job on them, just not as fast as I would have liked. My time through the first half was doing good, about 1 hour and 31 minutes. 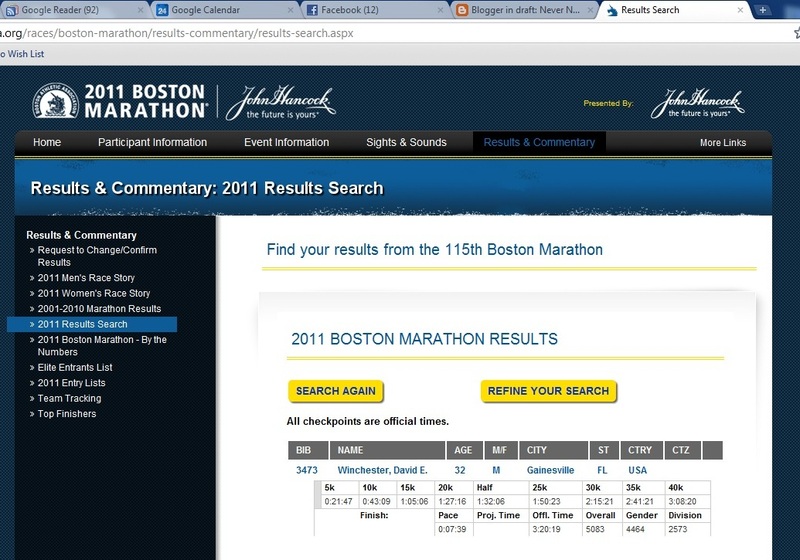 Clearly not the kind of time that would get me a sub-3 hour finish, but a strong effort nonetheless. Two factors took their toll however. First, the hills slowed me down, which was to be expected. But, I did a good amount of hill training and I think that did me well. What I had not planned for was the second factor, the sun. Most races start early in the morning, between 5 and 8 AM. Often, you have a solid hour or two with little to no light since the sun is not up yet. Boston starts at 10 AM (used to be noon). So while the weather could not have been more perfect (temperature in the fifties, sunny, and with a westerly wind), the sun was hot and relentless. I had been hydrating with what is a normal amount of fluid for me, a cup every few miles. By the time I hit mile 20 though, I felt thirsty. That is not a good thing, since usually by the time you are thirsty, it is too late to catch up. I did my best and stopped nearly every mile for water, but my stamina and performance dropped off. The time really flew by, thanks to the nonstop support. Before I knew it, a well known Boston landmark was greeting me on the horizon. 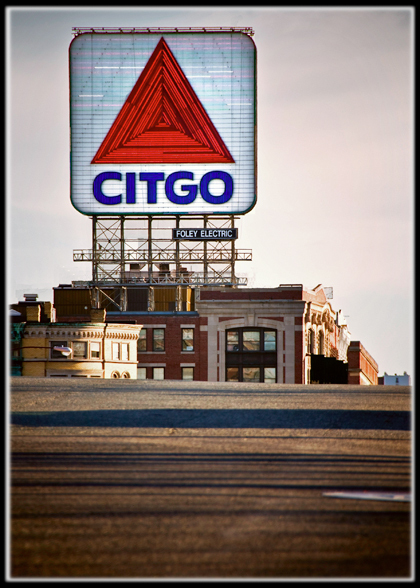 The huge Citgo sign seen below marks one mile to go. Of course given its size, you can see it well before the 1 mile mark, but it does signal the end is approaching. Then, as emblazoned on a t-shirt from the expo, it was a "Right on Hereford, Left on Boylston" and the finish was just ahead of me. Soon, the unicorn medal would be mine! I finished the half in 1:32:06 and 26.2 in 3:20:19. At the end, I was moderately dehydrated and it took me a while to get over feeling lightheaded and a little nauseated. Erin was there at the finish waiting for me with her sign and we walked (I shuffled) to the nearest T stop and rode back to the hotel for a shower and a little rest.